Even if you don´t need to travel to Roosevelt Island and get another view of New York skyline, it´s really nice just to travel to the Island. You will actually get a totally different view of Manhattan. Take a trip with the not too wellknown tramway over to Roosevelt Island. You will get a different view of Manhattan skyline. Don´t forget your camera! when you walk around Roosevelt Island it feels like you nearly are at the country side. The Tramway was built by the Swiss company Vonroll under designers Prentice & Chan and Ohlhausen in 1976. The tram can hold 125 people. (about 115 people standing and about 10 sitting). Inside the tramcar, there are very few seats, but many poles, rings, and bars to hold onto. It travels a distance of 3,100 feet at an average speed of 16 mph. . It rises to a maximum height of 250 feet and travels at certain points parallel and slightly above the adjacent Queensboro Bridge, linking Long Island City, Queens, and 59th Street in Manhattan. How long time will it take and were? The Roosevelt Island Tram begins its journey at the elevated station on 2nd Avenue and 60th Street and completes its rounds at the Roosevelt Island Station. The trip only takes 4 ½ minutes. 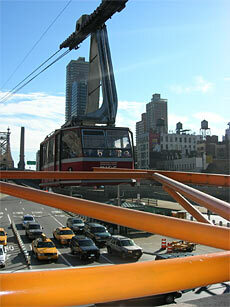 The Roosevelt Island Tramway was only supposed to be temporary until the subway station opened. But the tram was to popular to discontinue. 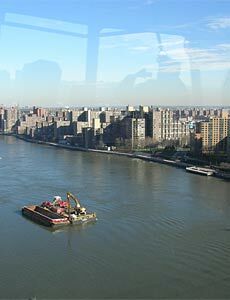 Roosevelt Island , formerly known as Welfare Island , and before that Blackwell's Island , is a narrow island in the East River of New York City. Also known as (before colonization) Minnahononck by the aboriginal Indians. 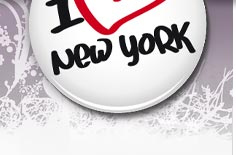 It lies between the island of Manhattan to its west and the borough of Queens on Long Island to its east. Roosevelt Island Running from Manhattan's East 46th to East 85th streets. The Island is approx 2 miles long. 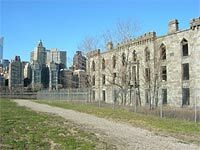 At the Island a Prison was build 1853 and 1854 they also had a small-pox hospital on the Island. Some buildings are still left today from this time but today as ruins. It is a fantastic feeling just to walk around here and look over to the Manhattan side. -A Roosevelt Island Tramway car is held hostage with some UN-delegates, in the 1981 Sylvester Stallone film Nighthawks. - In the 1993 film For Love or Money , Doug Ireland ( Michael J. Fox ) wants to buy the "abandoned hotel" at the south end of Roosevelt Island. - Near the end of the film Spider-Man ( 2002 ), the Green Goblin blows up the Roosevelt Island side tram station and leaves a group of children hanging inside one car. He also brings Spider-man down to fight with him in an abandoned building on the island. - In the movie Léon you can see the character Matilda (Natalie Portman) travel alone with the tramway. More Spider-Man: The tramway is also reproduced on the cover of the Comic "the Amazing Spider-Man" in the november issue from 1976.